Despite differing views on the actual effects of alcohol during pregnancy, one thing is certain that whatever the expectant mother imbibes during this period reaches the fetus through the placenta. So if one has a few drinks during pregnancy, some residual amount of the alcohol is bound to reach the growing baby. The exact amount of alcohol that is safe during pregnancy has never been ascertained for sure, though it has been proven that heavy drinking or binging has direct correlation with several complications and even post birth disorders amongst babies. Primarily alcohol is toxic in nature and in whatever quantities it is imbibed it will ultimately get absorbed into the bloodstream and find its way to the growing baby and will inhibit the development of its systems and parts. The most commonly affected parts of the growing baby include the face, heart and the brain. Alcohol during pregnancy has been proven to be one of the most distinct causes of permanent damage to the brain cells of the evolving life. This kind of damage will have serious implications on the individuals learning, motor skills and body coordination throughout life. The extent of damage due to the effect of alcohol on babies depends upon several factors which include the quantity being consumed, the phase of pregnancy when alcohol is being consumed and the frequency of consumption. Heavy drinking is also known to a prime reason for miscarriages and premature birth. Effects of alcohol during pregnancy that are directly translated into a pattern of physical and mental disorders which develop in the fetus are termed under a common syndrome called the Fetal Alcohol Syndrome. There are various forms in which this syndrome manifests itself caused by the effect of alcohol on different parts of the growing fetus. Some of the more common effects of alcohol during pregnancy are discussed in the succeeding paragraphs. Prenatal exposure to alcohol is directed responsible for deficiency in growth of the baby in terms of both weight as well as height. The severity of the effects of alcohol in this regard depends on a variety of factors but can range from a 10 % deficit in height and weight in mild cases to an astounding 30 % deficit in the more severe cases. Small heads, bent or fused fingers, limited movement of joints and oversized ankles are some of the other manifestations of the effects of alcohol on the growing fetus. Children with Fetal Alcohol Syndrome have certain distinct craniofacial abnormalities which include a marked groove between the nose and the upper lip, thin upper lips, and decreased eye width. The severity of these facial deformities increases with the level prenatal alcohol exposure. Drooping eyelids, skin webbing in between the base of the nose and the eyes, upturned and short nose, cleft lips, sunken bridge of the nose, small jaw, poorly formed and low set ears are some of the other abnormalities that can be noticed in babies with prenatal exposure to alcohol. Additionally the level of facial abnormality directly attributable to alcohol also implies a certain degree of brain damage. This is the most vulnerable system that bears the brunt of alcohol during pregnancy. Alcohol during pregnancy produces varying degrees of damage to the nervous systems ranging from mild dysfunctions to severe impairments and structural damage to the parts of the nervous system. Structurally the size of the components of the brain can be seen to be deformed and may even be of smaller sizes than normal. Neurological effects of alcohol include epilepsy, impaired motor skills, loss of hearing, clumsiness, impaired coordination of eyes and hands and restricted cognitive abilities. Some functional effects of alcohol during pregnancy are experienced in the behavioral pattern of the baby during its growth into an individual. These symptoms include learning disabilities, poor social perception and adaptability, restricted communication abilities, abstraction, lower mathematical skill, impaired judgment and poor memory. There are several other alcohol related birth defects which stem from effects of alcohol during pregnancy. Minor cardiac murmur is often seen in babies who have moderate prenatal exposure to alcohol. Joint anomalies and disorders along with renal problems such as hypo plastic kidneys, light sensitivity, poor visual acuity and involuntary eye movements are some of the other effects of alcohol. Even genital malfunctions are caused due to such kind of exposure to alcohol. Babies with this syndrome often grow up to become individuals who have criminal inclinations and abnormal sexual behavior. In many cases Fetal Alcohol Syndrome is manifested through high dropout rates among such kids. Even clinical depression is high among people who have had prenatal exposure to alcohol. The procedure for treatment of babies suffering from this syndrome is long and tedious without any confirmed results in most cases. Since the damage to brain cells are permanent in nature it is unlikely that complete cure is possible though there are a few medical and behavioral interventions which are being experimented with. 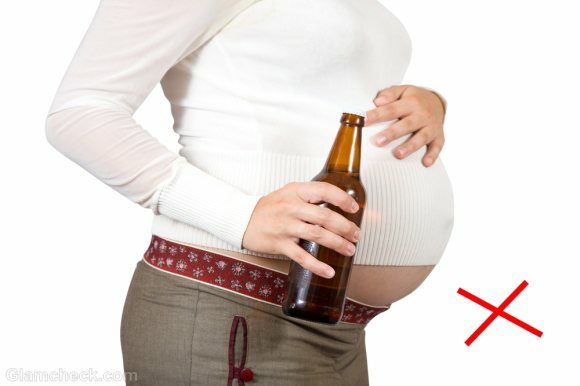 How Much Alcohol will not have Any Effect during Pregnancy? Certain medical theories suggest that mild and controlled intake of alcohol will have no effect on the forthcoming baby’s body and mind. However the exact quantity that falls within the purview of this state of ‘mild drinking’ has not been clearly stated anywhere. Traditionally 10 ml of pure alcohol is considered to be one unit which however varies with the type of drink that is being consumed. The level of retention of alcohol in blood also varies for different drinks. Thus the actual effect of alcohol cannot be accurately measured and hence it is always better to stay off drinks for the period of pregnancy. Till what Stage will there be No Effects of Alcohol during Pregnancy? The damaging effects of alcohol can take place even if you are 1 or 2 months pregnant. Thus there is no clearly defined stage of pregnancy which is immune to the ill effects of alcohol. Therefore rot is best to completely stop drinking right from the moment you realize that you are pregnant. In fact most doctors agree that women should stay off alcohol even before they conceive. There are many who would advise that they drank through their pregnancies and still had wonderful kids. While in some cases this may be true, but there is always the dangers of inflicting Fetal Alcohol Syndrome on the unborn baby by indulging in drinking in this critical phase. It is also essential to understand that the damage that takes place on the developing fetus at any stage of the pregnancy is going to be permanent in nature and the baby will have to suffer for life with those disorders. This discussion may not have painted a cosy picture but it was never intended to do so. The horrifying effects of alcohol during pregnancy must be understood comprehensively by any woman who is planning to bring a new life to this world. It would be mother’s duty and responsibility that she brings to this world a healthy and mentally sound human life. The actual damage of alcohol during pregnancy is yet not correctly fathomed by medical research. Thus one should never take a chance with her baby’s future. Stopping drinking completely is the only means available to ensure that these dreaded disorders stay away from your baby in totality.